These technologically-advanced rubber roofing tiles deliver an incredibly authentic shake roof look. They are incredibly easy and fast to install and cost less per square feet than similar shake alternatives. 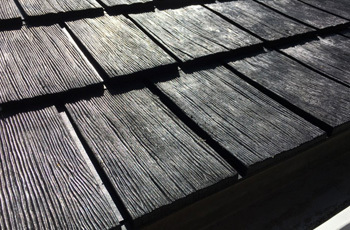 Made of 70 percent recycled tire rubber and an additional 15 percent post-consumer recycled materials, Beaumont shingles live up to the Euroshield commitment to environmentally friendly practices. Shake roofs are notoriously difficult to install, making the process costly and prone to error. Unless you find a roofer with years of experience with installing shake roofs, you may end up with problems down the road. Not all shake roofs are fire resistant, Euroshield roofs are. Most wood shake roofs require a significant amount of maintenance in order to get the maximum life expectancy from them. Rubber roofs are virtually maintenance free. And unlike other types of roofs, wood shingles need to be maintained by a professional. They are not a very good choice for a DIYer. Wood shake roofs are susceptible to sun damage, moisture damage, and fire damage. They can rot and crack. And repairs are very expensive. The only way to make sure that your new roof will be installed to the specifications required to maintain its warranty is to work with a certified contractor. If you are re-roofing an existing home, there are particular requirements your contractor will need to pay close attention to. We are one of only a few certified roofers in Alberta. You can have confidence in our workmanship and our commitment to quality. If you need a new roof and want the best possible option, give Golden West Exteriors in Edmonton a call. We’re expert roofers with a decade of experience with cedar, tile, metal, rubber roofs, and more. We’ll help you make the best choice, providing outstanding customer service throughout the entire process. We’ll install your new roof with great attention to detail and craftsmanship. We look forward to working with you.